John R McKay was born and raised in Wigan, near Manchester, England, and after serving in the Royal Air Force for seven years he joined Greater Manchester Fire and Rescue Service in 1997 until leaving to take up other pursuits, including writing. John's debut novel, the thriller 'The Journal', tells the story of a young man trying to come to terms with the death of his partner whilst avoiding a killer. It takes the reader from modern day England back to the two world wars, where the mystery of what is happening to him can be revealed. His second novel, the acclaimed 'The Absolution Of Otto Finkel', is a historical novel covering largely unknown events of World War 2 and how war affects people in different ways. John has carried this premise for many years and is extremely proud now the work has been completed and published by Pegasus. Taking a break from the historical fiction genre, John's third novel 'Mosquitoes' is a contemporary study of how a man can 'lose the plot' when circumstances in his life change suddenly. A black comedy, Mosquitoes is a uniquely written story, told from the perspective someone unable to cope with both the pressures of modern society and those he puts on himself. John's fourth novel, 'The Sun Will Always Shine' is a tale of two brothers during the time of the First World War who are the keepers of a dangerous secret and find the only escape in the horrors of the trenches of northern France. 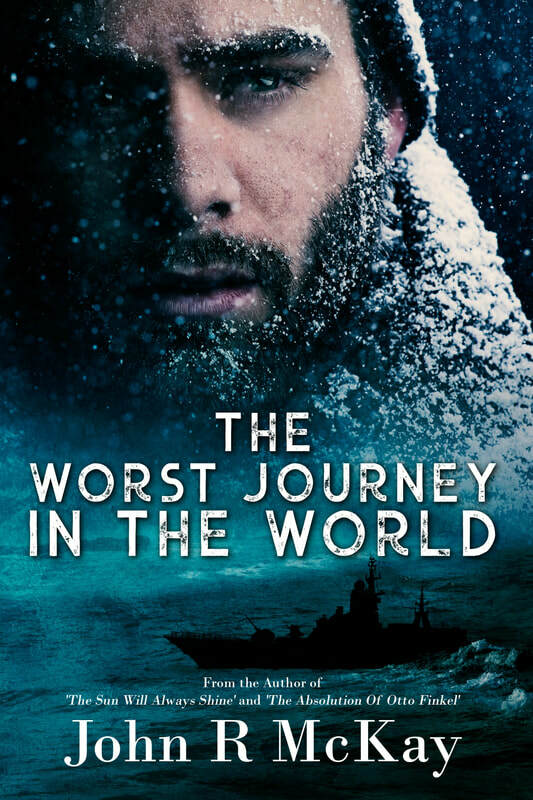 His latest release, The Worst Journey In The World, is based on the Arctic Convoys of World War 2. He is currently working on his sixth novel, which he is hoping to release later this year. ‘The Journal’ takes the reader from the streets of modern day England to the battlefields of early twentieth century France. It is the First World War, April 1917, and on the eve of the Battle of Arras, in an underground holding area, a British soldier is found dead in suspicious circumstances, leaving his war weary commanding officer with a problem on how to investigate the death so close to the action. Fast forward to 2012 and to Northern England. As Danny Cooke, a reporter for a local newspaper, is trying to come to terms with the sudden loss of his girlfriend, who has been killed in a hit and run accident, he is informed that he has been mentioned in the will of a member of the British aristocracy and must travel to London for the will reading. There he is given a seventy year old journal that will offer an explanation as to why he is one of the beneficiaries of the stranger’s fortune. Whilst in London, Danny is targeted by a professional contract killer and flees to Paris whilst the police detective assigned to the case carries out investigations and attempts to apprehend his attacker. Safely in Paris, Danny reads the journal which he finds has been written by the aunt of the late baronet. In it she reveals family secrets that leave Danny shell-shocked and he realises that things that happened in this strange family’s past so many years ago now have a direct effect upon his own life. With the killer in pursuit, Danny fears that moving to Paris may not have been such a good idea after all. With flashbacks to the First World War and the London Blitz, 'The Journal' follows Danny's journey as he tries to come to terms with his loss whilst at the same time avoiding a killer. The memories for most of them fade with time but for Otto, the mental scarring matches the physical scarring. Is this the reason why, years later, in the turmoil of war, he finds himself as an officer in the Waffen SS? Largely unbeknown to them, the paths of the schoolboys, now young men, impinge on Otto’s life as each chooses to serve their respective countries in different ways. Following their wartime exploits, from the beaches of Dunkirk to the purge of the Roman ghetto, from the horrors of Drancy Deportation Camp to the Nazi ratlines of post-war Europe. This is a powerful story of war, grief, love and regret. "You can never win an argument with a stupid person." Alex Sumner has had enough. Things aren’t going well for him. Not well at all. Forced to work with idiots, disappointment meets him at every corner. His job is under threat, his wife shows him no interest and his big break as a writer always seems to be on the horizon, never getting any closer. Then one day something within him snaps and he is prepared to suffer these fools no more. On a path of self-destruction and paranoia, he finds himself in a secure psychiatric hospital and reflects back upon the strange events that have caused him to be there. And is any of this his own fault? Set before and during the First World War 'The Sun Will Always Shine' tells the story of brothers Harry and Charlie Davenport, who live on a farm in northern England, and their attempts to protect their mother and sister from their abusive and violent father. They believe that their father's increasing brutality needs to be stopped and they will need to carry out strong action to do that in order to protect their family. With war approaching they realise that these actions could have terrible consequences upon the very people they have sworn to protect. As suspicions grow ever stronger, could they find an escape in the trenches of the Western Front before their secret is revealed and their world is ripped apart? This is a tale of war, grief, horror, lost love and sacrifice and is John R McKay's most powerful novel to date. When George Martin joins the crew of the Royal Navy frigate, HMS Virtuous, he is keen to start his new life at sea, but after trips escorting relief cargoes to the stricken island of Malta, he soon realises that life on a warship is anything but easy. After the invasion of the Soviet Union by German forces in 1941, George finds himself on the Virtuous’s most perilous journey yet, as it forms part of a convoy heading to Russia. Hunted by Nazi U-boats, surface ships and the Luftwaffe, the crew must endure its greatest foe - the harsh Arctic weather. With temperatures dropping to minus 30 degrees Centigrade and violent storms threatening to sink the ship, George endures the harsh reality of war, whilst at the same time pondering his uneasy relationship with the mysterious Glenda, the girl he has left behind.